The operation against the west marshalling yards at Sarajevo, Yugoslavia was carried out during the daylight on November 7, 1944. The marshalling yards at Sarajevo were an important target because they represented the only escape route by rail for German troops leaving the southern Balkans. The yards had been attacked by groups of two or three 37 Squadron Wellingtons twice in the previous week with little or no success. This, the third attempt, would be a full scale operation. 88 aircraft of 205 Group participated, 11 of which were Wellingtons of 37 Squadron. MacIsaac and crew (plus Sgt. Lewis in the forward gun turret) took off from Tortorella at 1401 hours carrying seven 500 pound bombs, one 500 pound bomb with a 12 hour time delay fuse, one 500 pound bomb with a 6 hour delay, eight 250 pound bombs, and 10 packets of nickels. MacIsaac was again the Flight Leader for 37 Squadron. They flew in Wellington Mk.X MF473 "A". The weather was clear up to the Yugoslav coast, at which time ten-tenths cloud was encountered, however, the cloud cover had cleared by the time the squadron reached Sarajevo. Flak at the target was heavy caliber and very accurate. The AA fire was supplemented by slight, inaccurate flak from the Mostar area. Wellington "X" of 37 Squadron, piloted by P/O Eid, RAF, was shot down by flak before reaching the target. The remaining aircraft attacked, dropping one 4000 pound bomb, sixty one 500 pound bombs, eight 500 pound bombs with 6 hour time delay, seven 500 pound bombs with a 12 hour time delay fuse, sixty eight 250 pound bombs and ninety packets of leaflets between 1530 and 1534 hours from altitudes of 11,000 to 14,000 feet. The attacking Wellingtons saw the marshalling yards partially shrouded in smoke and seven crews claimed sticks straddling the yards. Bombing was not up to the usual standard of concentration and there were several bad cases of sticks going astray and hitting the city. MacIsaacs bombs were dropped on target at the west end of the marshalling yards. As the Squadron was landing at Tortorella tragedy struck when the fifth Wellington in the landing circuit, Wellington LP603 "R" captained by F/O Lavack, blew up upon touching down on the runway - probably due to a hung up bomb detonating in the aircrafts bomb bay. While the pilot managed to escape unscathed, the remainder of the crew was severely injured and taken to the hospital in serious condition. The remaining five Wellingtons, including W/O MacIsaac circled overhead for 45 minutes while the fires were extinguished and the remains of Wellington "R" were cleared from the runway. MacIsaac landed safely at 1730 hours. They are buried in Italy at the CWGC Bali War Cemetery. It was just their second operation. They are buried at the CWGC Belgrade War Cemetery. 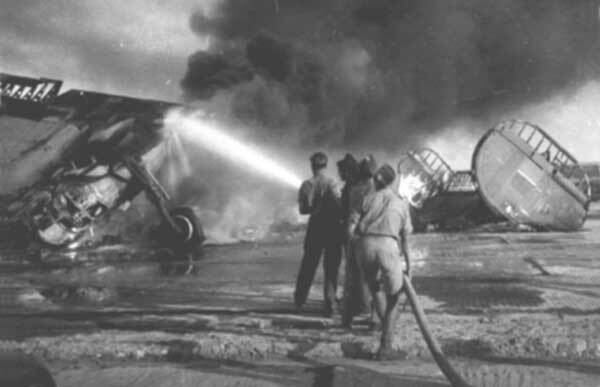 The result of landing with a hung-up bomb: a 205 Group Liberator of 40 Squadron on fire after blowing up on landing at Foggia. RECREATION - Liberty runs have been instituted from the Domestic Site to Foggia, leaving camp at 1700 and 1800 hours and returning at 2100 and 2230 hours.